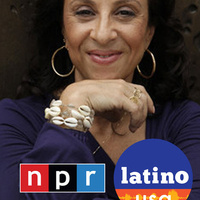 Latino Media Arts & Studies presents Maria Hinojosa, anchor and executive producer of NPR's Latino USA. She will be in conversation with UT Journalism Professor Maggie Rivas-Rodriguez. KUT will host a reception following the talk in the KUT event space, from 5-6 pm. Both events are free and open to the public. As the anchor and executive producer of NPR's Latino USA, and anchor of the Emmy Award-winning talk show "Maria Hinojosa: One-on-One," Maria Hinojosa has informed millions of Americans about the fastest growing group in our country. Previously, a Senior Correspondent for NOW on PBS, Hinojosa has reported hundreds of important stories—from the immigrant work camps in NOLA after Katrina, to teen girl victims of sexual harassment on the job, to Emmy Award-winning stories of the poor in Alabama. Hinojosa's important contributions to journalism and social justice reporting have been acknowledged with a range of awards and honors, including a Peabody Award for Latino USA; four Emmys; the John Chancellor Award for Excellence in Journalism; the Robert F. Kennedy Award for Reporting on the Disadvantaged; the Studs Terkel Community Media Award; the Edward R. Murrow Award from the Overseas Press Club for best documentary; and the AWRT Gracie Award for Individual Achievement as Best TV correspondent. She has taught in the Latin American and Latino Studies program at DePaul University and in April 2010, Hinojosa launched The Futuro Media Group with the mission to produce multi-platform, community-based journalism that gives critical voice to the voiceless by harnessing the power of independent media to tell stories that are overlooked or under reported by traditional media. She is a frequent guest on MSNBC; has been named among the top 25 Latinos in Contemporary American Culture by the Huffington Post; and was recently honored as one of People En Espanol's 25 most powerful women. Co-sponsored by KUT, Center for Mexican American Studies, the Moody College, Mexican American and Latina/o Studies, School of Journalism, and faculty in Radio-Television-Film.